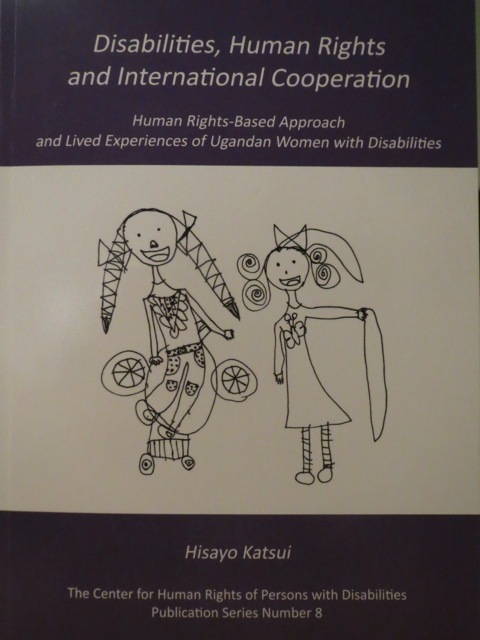 This scientific blog is established in connection to our research project ‘Human-Rights-Based Approach to Disability in Development: Interplay of Disability-Sensitive Development Cooperation and National Policy in Uganda’. A participatory research method is applied in the research project, which means that persons with disabilities in Uganda are included throughout the research process. The blog’s aim is to be a space for formulating our thoughts. The blog faclitates the research process. This Ugandan disability research project was concluded in the end of September. From my part, it was concluded when findings were delivered back to the Ugandan disability movement in October during my last visit to Uganda. I had three main activities to deliver the findings. Firstly, I visited the three deaf women in villages whom I interviewed during my visit in 2008. Popular version of the book was produced so that those who are illiterate also receive findings and information in the colour-printed pictures. Obviously, pictures also have shortcomings and cannot reach, for instance, those with visual impairments. However, as I focused on deaf women in my research, I decided this way of delivering messages. I visited their homes one by one, and gave both popular version and a copy of my book to these three deaf women. I was very happy to see them again, while they also welcomed me with big smile. One of their family members said, “I didn’t know that a mzungu (white) could love us so much.” I felt complicated by this statement, because of the perception generally attached to white people who only use them and leave them. This is something to think about for my future work, definitely. Secondly, I held a book launch at NUDIPU, the National Union of Disabled Persons of Uganda, the umbrella organisation of persons with disabilities. I invited DPOs and informed them beforehand that I was not paying any sitting or transportation allowance as many development agencies do for holding a meeting. Nevertheless, some 25 people showed up to pick up copies of my book. This was encouraging under the circumstance where people are used to receiving money for any meeting. Thirdly, I also taught human rights Master students on disabilities and human rights at Makerere University for one whole week; 5-8 pm everyday. Obviously, the teachings based much on the findings of my latest book. But I am particularly happy for the three guest lecturers who came to deliver their strong messages to the future leaders of the country: one woman with a physical disability who was one of my research assistants, one deaf woman who is the executive director of Deaf women’s organisation, and one man with a physical disability who is the newly elected Committee member of the Convention. They were eloquent and powerful. I assume that the students would never forget these personal experiences of communicating with such powerful disability activists from their own country, even when they forget about my lectures! My research on disabilities, human rights and international cooperation continues. I am now employed as research and development manager at Abilis Foundation in Finland and also work as the research assistant to the United Nations Special Rapportuer on Disability, Shuaib Chalklen. My experiences with Ugandan disability stakeholders will continue to help me to modestly act towards equality from my own part as a researcher. This book is not meant for profit making. When she was alive, Maija Könkkölä told me that information useful for the disability movement should be free. I totally agree with her and so I do not sell it to anybody, though there are some printed copies of the book (only 260 copies). Abilis Foundation, VIKE, FIDIDA as well as Finnish Academy financially supported the publication so that I could make as many copies as possible to bring to Uganda. I also bring 200 copies of popular version of the book so that I can give my findings back to Ugandan persons with disabilities, many of whom are illiterate. For those of you who have an access to Internet and are literate, I kindly ask you to download the following chapters in PDF files and read them on-line. For those of you with visual impairments who have difficulties reading PDF files, I will be happy to send you Word files. Please write to me to hisayo.katsui (at ) abilis.fi I hope you enjoy it! KEPA development policy day: disability as an indicator for a human rights-based approach to development? - Anabela Lemos and Tuomas Tuure as the Finnish NGO reprensetatives. All were concerned about the shrinking space for civil society ironically after the Arab Spring. Many challenges were also presented including the division between service delivery-oriented and watchdog-oriented NGOs; between Northern and Southern NGOs; between domestic and international policies of Northern states (double-standard), and so forth. Ethiopia was much focused due to the restrictive state environment against civil society. On the one hand, Kiak and Reisen, are of the view that development aid should not go to such undemocratic governments and prefer democratic ones by highlighting values. On the other hand, NGOs are finding ways to deal with such difficulties in creative solutions. 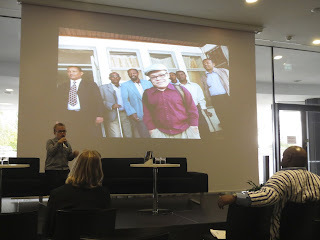 Tuomas Tuure of the Threshold Association introduced how creatively it deals with human rights when governments are not tolerant to human rights. As disabilities are often considered as social issues, this was used as a tool to cut into such contexts. Disabilities are not threatening political issues in many countries. This is one characteristic of disabilities. I think on the other side of the coin is that disabilities are still not human rights issues. They are often not included into mainstream discourse of development. Conversely, this means that proper inclusion of persons with disabilities could become the benchmark of comprehensive development cooperation. This could be even an indicator for measuring a human rights-based approach to development that the Finnish government is trying to promote. All the speakers were in the strong believers on people’s power and democracy. That democracy should not leave marginalised groups of population. 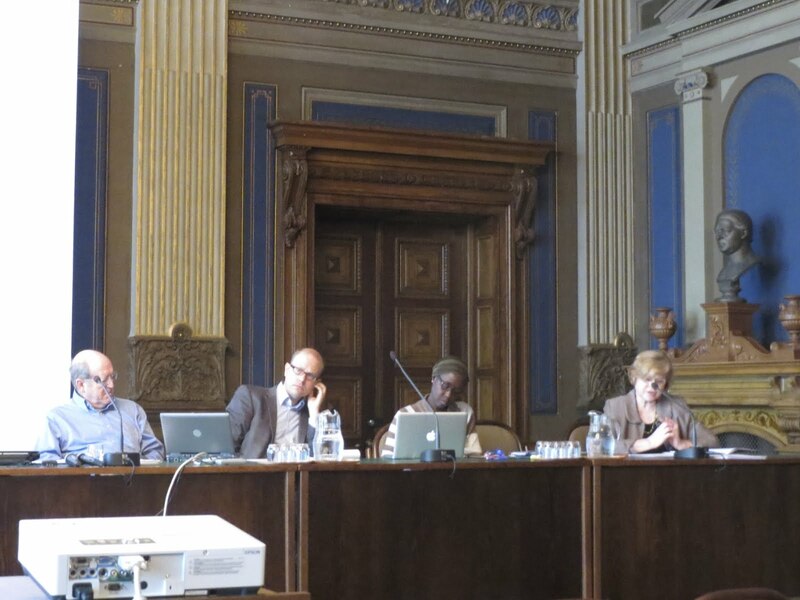 Hisayo attended the Seminar on Development Cooperation Evaluation by the Finnish Foreign Ministry between 26-28.9. The Unit of Development Evaluation of the Finnish Foreign Ministry held this evaluation seminar inviting Ministry staffs, NGOs, consultants and researchers. The trainers were “evaluation experts,” Oumoul Ba Tall and Jim Rugh. They say, “Competition is high (in the development cooperation world) to receive funding. And thus expectation towards evaluation is high.” However, in the very complicated world as of now, evaluation of a single intervention particularly pertaining to impacts assessment has become extremely challenging. There was a lot of discussion on unrealistic TOR for an evaluation work: too big scope and demands of commissioners (often donors) on the evaluation, as well as too short timeframe and too little budget. Often TOR is not negotiated between the commissioner and the consultant(s). But it was recommended to discuss on it and negotiate so as for the evaluation work to be realistic and feasible. Another advice was to start the evaluation process already in the beginning of an intervention in the form of baseline study and continue with mid-term evaluation and then finally the end evaluation, if possible also post-evaluation. The Finnish evaluation works are mostly done only in the end of interventions, which was suggested to change. More participatory approach involving local consultants was also discussed, as hitherto Finnish evaluation works are mostly externally done by consultants from Finland. Both internal and external perspectives would be beneficial for an evaluation work. I was very concerned about the seminar discourse which did not properly involve marginalized population including persons with disabilities. I raised my hands for a few times to point out the importance of human rights-based approach with the principle of non-discrimination so that marginalized population would also be included properly both in development cooperation activities and evaluation works. However, the trainers replied to my comments by saying, “Yes, special study and special intervention focusing on marginalized population are also good.” Disaggregated data collection and specialized interventions are obviously important, but they are not sufficient. My point was to mainstream persons with disabilities and other marginalized groups in practice of development cooperation as a whole. At least in small group discussions, seminar participants in the same group took my ideas seriously, which was encouraging. When I talked with Aira Päivöke of the Evaluation Unit of the Ministry over a lunch, she was also aware of the fact that implementation of a human rights-based approach in the Ministry has still been largely missing, though DPOs are filling the gaps at the grassroots level and the development policy is based on human rights. She claimed that disability sensitiveness is missing in between grassroots and policy within the Ministry. To improve this situation, the Ministry is calling for an advisor specializing in marginalized population. It’s so dynamic and interesting time to live in Finland particularly in terms of international cooperation in the field of disability! (<--Ms. Anne Sipiläinen, the Undersecretary of State in Finland, is on the back in the middle surrounded by the Abilis coordinators from the global South.) Abilis Foundation had a one-week-seminar during this week with its coordinators from 11 countries: Bangladesh, Cambodia, Ethiopia, India, Kazakhstan, Kyrgyzstan, Mozambique, Nepal, Tajikistan, Tanzania, and Uganda. The partner organization from Somaliland was not granted a visa and could not participate to this seminar. I am going to be in charge of evaluation of Abilis Foundation for the coming 3 years, and I joined four sessions of the seminar. The first is the visit to the Ministry for Foreign Affairs when the international coordinators met with Anne Sipiläinen, the Undersecretary of State in charge of development cooperation and development policy. She took one whole hour to listen to advices and experiences of working with persons with disabilities. Everyone in the meeting was given the opportunity to express one’s experiences and suggestions to the Ministry. After each suggestion, she deeply showed her interests and expressed the importance to disability rights. On the basis of my own research experiences, I suggested the Ministry to pay attention to 1) the ownership of persons with disabilities in its both top-down and bottom-up development cooperation activities, and 2) the prerequisites for persons with disabilities in the global South to be able to access development cooperation activities including Abilis Foundation. I also added the importance of research to remember in this area! It was very encouraging to have witnessed that the person of that high rank in the Ministry was interested in meeting the international guests of Abilis Foundation. Secondly, I facilitated the discussion on evaluation in the field of disability. The coordinators gave advices to what I should pay attention and on what kind of indicators could measure impacts in this particular field. 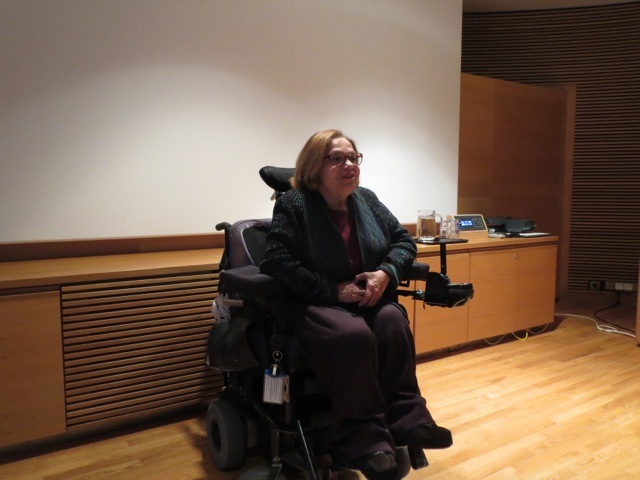 Thirdly, I gave a lecture with Rea Konttinen on human rights-based approach to disability and development. Hisayo in New York as the assistant of the United Nations Special Rapporteur on Disability between 10-16.9. 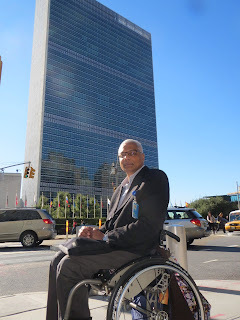 (Picture: The Special Rapportuer, Shuaib Chalklen, in front of the United Nations.) The Rapporteur attended the Civil Society Forum, the 5th Conference of State Parties (COSP5) of the Convention of the Rights of Persons with Disabilities (CRPD), and the Global Partnership on Children with Disabilities, Partners’ Forum by UNICEF. He spoke, chaired and concluded various sessions during the aforementioned events. Moreover, he had 16 personal meetings with different disability stakeholders including UN agencies’ representatives, the African Union Ambassador to the United Nation, bi-lateral donors, and global and local organisations of persons with disabilities (DPOs). I had this great opportunity to experience and observe these events and meetings as the Rapportuer’s assistant. The schedule was really hectic starting from early morning with breakfast meetings till late at night with dinner meetings. But it was extremely empowering experience for me, or anybody there. Main agenda was to find ways together and individually in increasing visibility of disability in the high level meeting on disability in September 2013 among the member states of the United Nations, thereby also that in the post-Millennium Development Goals (MDGs). The mistake of MDGs not including disability rights should not be repeated, which was the consensus for the post-2015 agenda. The disability stakeholders will ensure that their united voice will be heard. The Rapporteur was one of them trying to highlight the importance of these forthcoming events. 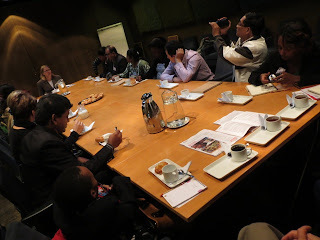 The Rapporteur had another important aim for this trip: to get consensus on the establishment of African Disability Forum under the African Union Disability Architecture. The Forum will disseminate information to primarily African DPOs but also to the government officials. Information available at an international level had many times failed to reach at African disability stakeholders including the Rapporteur himself. Such information dissemination initiated by the Forum is expected to increase capacity of disability stakeholders. Everybody he talked on this Forum was in the same opinion that lack of information is one of the major challenges in Africa. Although this is the initiative of the Rapporteur, many stakeholders would like to give their inputs and ideas for this Forum, which has complicated the establishment process. This is unavoidable to go through, as opinions of relevant stakeholders have to be exhausted for establishing an activity at the African Continental level as this one. However, such discussions could also be driven by own interests of individuals or interests of different agencies that they represent for. Disability is diverse, development partners have complicated relationships among themselves, and personal feelings are also involved when it comes to issues around disability. The Rapporteur has not been successful in raising fund for this Forum activity yet. But it could become even more complicated when money is found, for doing a simple activity for increasing capacity of disability stakeholders in Africa. The meetings observation has taught me some challenges of making consensus in this field. I was totally overwhelmed by the scale of the global disability movement with powerful advocators including the Rapporteur himself, the vice-president of Ecuador in his wheelchair, and many, many others. As disability is too often considered as a minor subject in reality, I was greatly encouraged as a disability researcher to have witnessed this movement with my eyes in front of me. I hope many more younger disability stakeholders will have chances to attend such meetings as these ones. I am full of energy to move forward with my disability research works thanks to this trip! Today, I had the privilege to hold a two-hour-training session on Human Rights-Based Approach to Disability and Development. Abilis Foundation (www.abilis.fi) was established in 1998 as an organization of persons with disabilities specializing in funding activities of persons with disabilities in the global South. During 2011, the Foundation had 260 on-going projects on average that were run by organisations and groups of persons with disabilities, most of them on the grassroots. Since the establishment, the Foundation has applied human rights-based approach to development and prepared its policy document on human rights-based approach. As this document is based greatly on my forthcoming book findings, namely empirical theory on human rights-based approach to disability and international cooperation, I was invited to co-organise this training session with Rea. As all the staffs have accumulated great knowledge and expertise on disability in the global South through their daily activities, the training was enriched by their own experiences and thoughts around them when they presented their opinions. All participants deepened discussions with their own examples, which was the best part of the training. When we had a group exercise to plan a human rights-based project to be funded by the Foundation, one staff raised an interesting insight. When all are too well-prepared based on human rights, then people would become passive, too. This is a very interesting opinion. When there are rooms of improvement in terms of inequality, then persons with disabilities have to become active in transforming the reality. The analogy could be applied in the global North, when welfare state of Finland takes into account fundamental human rights of persons with disabilities, for instance, disability movement becomes weaker, perhaps. The point is, that the passivity itself is not an evil. When one decides to remain passive with her/his own choice, that is totally different from the passiveness due to disabling environments and/or low capacity of the person. The same goes to participation: non-participation with one’s own choice is not the same as non-participation in the form of exclusion. The self-determination concept, however, is quite tricky. 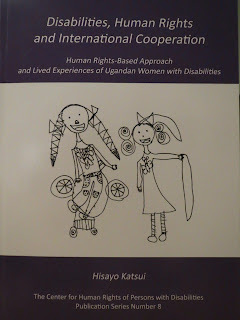 If you would like to go deeper into this discussion, please read my forthcoming book, “Disabilities, Human Rights and International Cooperation: Human Rights-Based Approach and Lived Experiences of Ugandan Women with Disabilities” to be published next month by the Centre for Human Rights of Persons with Disabilities (www.vike.fi). Thank you, Abilis staffs, for this wonderful opportunity to learn from your valuable experiences! And Rea, you are super good trainer! What is Participatory Research Method? equality and equal opportunity of disabled people particularly in the South. Jukka Kumpuvuori, LL. M., Researcher, Doctoral Candidate: I am Finnish researcher and a disability activist. I have a strong interest in the academic field of human right and disability and I have prepared quite several reports in this fields. 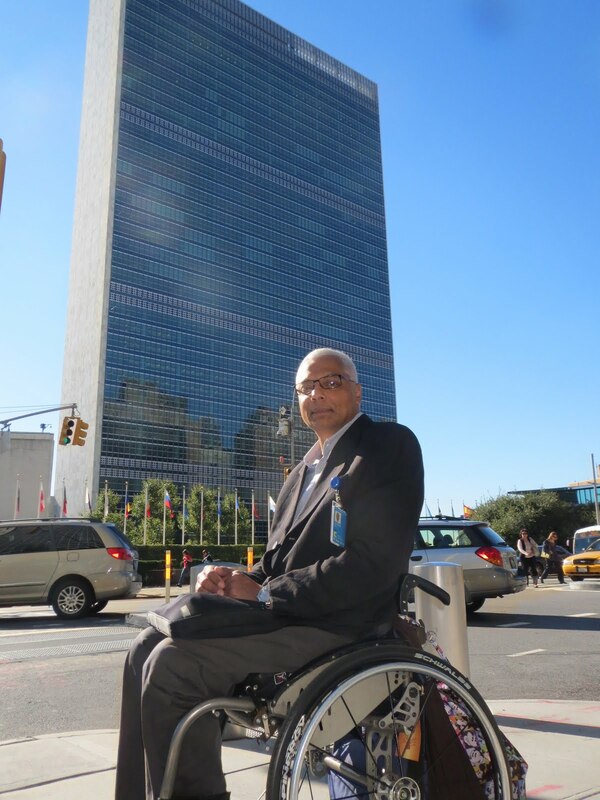 I am also active in the DPO-world both nationally and internationally and I also have a strong interest in the development cooperation that relates to disabled persons. I am my self a wheelchair user. Everything that relates to human rights and disability...I'm there! Edson Ngirabakunzi, MA, Researcher, Doctoral Candidate: I am a Ugandan disability activist with high level interest in disability and development issues. I have advocated for the rights of persons with disabilities in Uganda at national and local levels. This has been to ensure that disability needs and concerns become part of the development process in Uganda. I have been in the disability movement for the last 8 years as a key player. I have keen and strong interest in seeing how legislations take care and multiplier effect in the lives of disabled persons. I have participated in policy reviews and evaluations at ministerial levels. I have participated in a number of strategic meetings with line ministries and district local governments raising disability as key issue of concern in the development process. It is my firm conviction that once policies and programmes targeting disabled persons are judiciously followed and implemented then they would greatly contribute to making world a better place to live in and therefore humanity would boast of development for all.